↑ 1.0 1.1 Neha Maheshwari, TNN Apr 22, 2012, 12.00AM IST. "I've no strategies to keep Karan tied down: Jennifer Winget - Times Of India". Articles.timesofindia.indiatimes.com. http://articles.timesofindia.indiatimes.com/2012-04-22/tv/31379365_1_grand-wedding-wedding-dress-beautiful-wedding। আহৰণ কৰা হৈছে: 2013-04-11. 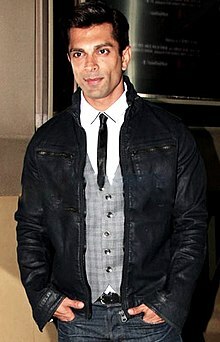 ↑ "'I am just like Dr Armaan' - Rediff.com Movies". Getahead.rediff.com. 2008-07-17. http://getahead.rediff.com/movies/2008/jul/17karan.htm। আহৰণ কৰা হৈছে: 2013-04-11. ↑ name=Armaan 'I am just like Dr. Armaan'. rediff.com, 17 July 2008. ↑ The witching hour, 24 January 2011. ↑ 'I am just like Dr. Armaan'. rediff.com, 17 July 2008.